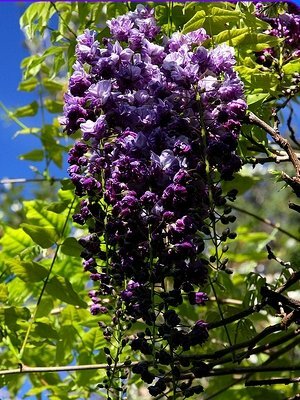 Wisteria floribunda Black Dragon (Wisteria Black Dragon) * Full sun to part shade * Zone 5-9 * 30ft tall Produces masses of sweetly perfumed, violet flower racemes a foot long!!! Black Dragon is a double flowering wisteria! Wisteria floribunda Black Dragon& is a very heavy bloomer! Like enormous clusters of grapes, the double-flowered purple blooms on this fast-growing plant dangle in giant foot-long bunches. The flowers appear at the same time as the leaves in spring, and remain for several weeks. Then in autumn, the vine offers another season of beauty with bright yellow foliage. Flowers open from the top and work downwards. Magnificent! Deciduous. The branches of Black Dragon Wisteria twist around their support, which makes them perfect for embellishing walls, gates, fences pergolas, railings, banisters, pillars or even leave them to climb and twist themselves around the trunks and branches of other trees. This adaptable shrub will also grow harmoniously on its own. In any case, it makes a perfect plant for the most modern to the most traditional of gardens. Wisteria Black Dragon is very low maintenance, it needs an occasional pruning if you want to keep it smaller. Prune after bloom. Culture: Water generously in spring to aid in establishment. The pruning of wisteria is easy, cut back new shoots to 8 to 10 inches in late July/Aug and reduce these further to 6 inches in Jan. 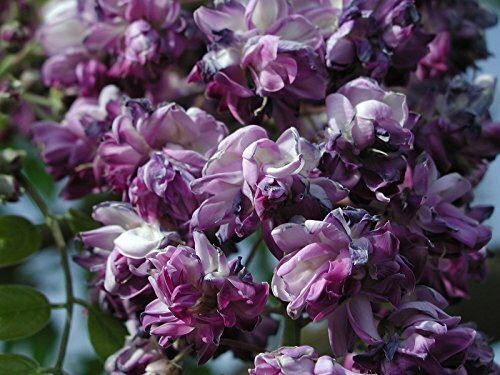 This will aid an abundance of flowers the following spring Wisteria Black Dragon is best grown in sheltered, warm and sunny positions, in moderately fertile and moist soils. Requires a strong support. Apply a slow-release balanced fertilizer and a mulch of well-rotted garden compost around the base of the plant in early spring.